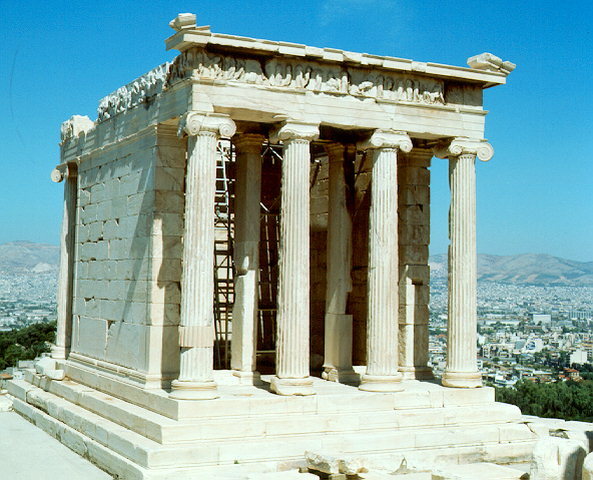 The Temple of Athena Nike (Featherless Victory) is situated southwest of the Entrance, on a rampart protecting the main entrace of the Acropolis. It was constructed in ca. 420 B.C. by the architect Kallikrates. It is built in the Ionic order, and it is amphiprostyle with a row of four columns in front of each of its narrow sides. The relief frieze on the upper section of the walls depicts the conference of gods on the east side, and scenes from battles on the other three. A marble parapet decorated with the relief representation of Nikae (Victories), protected the edge of the Bastion on which the temple was erected.